So, I've been using the Pixelbook for a couple weeks now and just found out this new cool feature. Not sure it's going to be SUPER useful or just handy and cool. Essentially, when I open the Pixelbook to log in I need to punch in my password for my Google Account (or I could have set it up with a PIN, but just haven't done that yet ... I will do that for my son's Chromebook so he won't get to know his Google password and purchase ALL THE THINGS!). I often don't punch my password in on a regular basis and it is a bit lengthy, so it's a bit of a pain. Well, good guy Google has a simple method for you to try. Smart Lock. 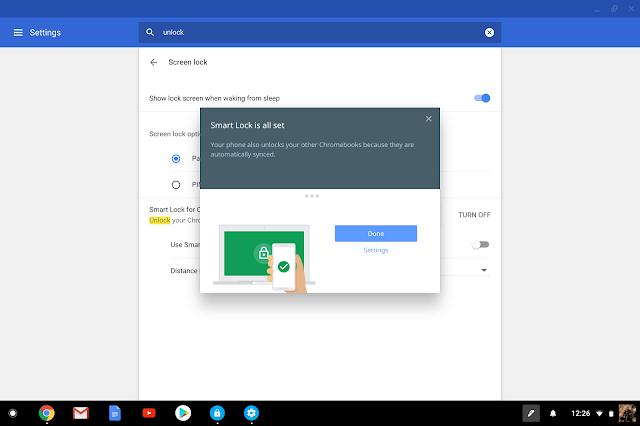 On a phone, you can set the phone to bypass 'unlocking' if there's a voice it recognizes, a bluetooth that it's paired to etc... Well, with the Chromebook you can do the same. To set it up go into the Pixelbook Settings and under People look for Screen Unlock. It will walk you through the set up you'll need to do with your phone. But then it's all set. So, next time you're using your phone, open the Pixelbook and click your photo and you're in. Now, for me I thought this would be super helpful; however, have found that often when I go to open my Pixelbook it's because I've already put my phone down. So to take advantage of this feature I have to pick up the phone and unlock it ... almost as many steps.